Hello, my name is Eline Janse. I'm Dutch and born in 1958. I've made my first steps on the field of handcrafts when I was 25 years old. Years I searched for a suitable hobby. It was much more difficult than I expected. I've tried many different types of handcrafs before I realised variation was the thing I was looking for. After a few months this house wasn't as lovely anymore as when I made it. At that time my husband suggested to change it into a summerhouse. So I did and to my surprise I realised this was the hobby I was looking for all these years. The versatility of working with many different materials gave me much satisfaction. I also liked the search to gets things in the right dimension and to synchronize them. 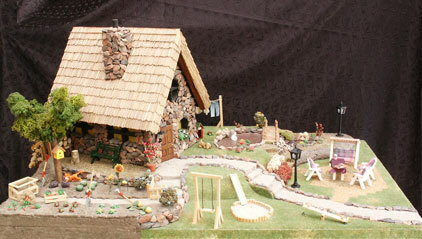 In 1993 I saw a magazine about miniatures and dollhouses. This speeded things up, because dollhouses and all things around these houses could satisfy my needs. So I specialized myself in making dollhouse rooms and boxes. I enjoy making a boutique and the next time a garage. different hobbies proved to be very handy. Throughout the years my speciality is making little furniture 1:12 in replica. When I see a nice piece of furniture in a antiek shop, I make a worktemplate and start working. Every time it's a chalange to make an exact copy of the real furniture. Who could think that years ago.